Working out can be hectic and also fun at the same time. When do you think it becomes fun? Obviously when all the exercises that you do start yielding desirable results. I know you would wish to know a thing or two about building bigger arms during your gym activities as well maximizing the results of your bench press. Apparently, many people give very little credence to the significance of carrying out triceps workouts. They tend to concentrate on building other primary muscles such as abs and biceps without noticing that the true test of strength actually rests on the ability to carry out the triceps exercises. Here is what is more interesting; the JM press is a great triceps/bicep bodybuilding, which was invented by one renowned legendary American record holder and power lifter in bench pressing known as JM Blakely. It is a kind of a hybrid workout move of a close grip bench press and a lying triceps addition. Over the years, this type of exercise has become popular among several powerlifters and has proven to be one of the best exercises in chiseling ideal bigger arms. Training for this workout can be tough especially when it is not done correctly. However, when properly conducted, it becomes the easiest and most convenient type of exercise to perform in the gym. However, it should never be mistaken to be a just a routine exercise that will only make you develop those appealing and strong ﻿﻿﻿arm ﻿muscles. It is an exercise that requires resilience, hard work and consistency. Remember the saying which goes that nothing comes on a silver platter? Yes! When carrying out JM Press, you need to be thorough to get the best results. I will give you the best guide that will help you in attaining the best results from this particular exercise. 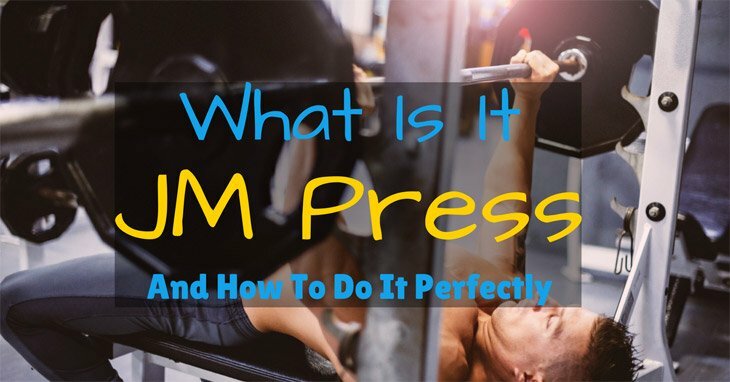 On how to do a JM press, the first thing that you need to do is to establish the ideal weight for you. Now you see, people are different and have diverse strengths when it comes to the weight they can be able to lift. Therefore, ensure that you identify and get a weight that you can lift comfortably. Next, load the bar with the weight after you have determined the appropriate one so that you may start the training. Fasten the short bands on the same bar and then support them to heavy dumbbells that barely move. The importance of this is that it enhances safety in the sense that you prevent any possible cases of getting injury since the attached weights shall remain intact on the bar. The other significance of this is that it will enhance stability during training because the weight will not be moving from one side to the other. Secondly, lie on the training bench and place your feet flat on the ground and at the same time driving through with your hips. Ensure that your back is steadily supported and your shoulder blades remain withdrawn. This way, you will be preparing your body for the exercise even before you start the actual lifting of the weights. The third step that you need to do is to take the medium pronated grip but at the same time cover the rings of the bar. Take the bar from t﻿﻿he r﻿﻿ack then hold the weight above your clavicle at the same time maintaining your arms extended. This is the position that you will be maintaining for some time as it plays a crucial role in this particular exercise. Actually, it is the first position for this workout. The next step is to lower the bar by extending your elbows slightly forward. 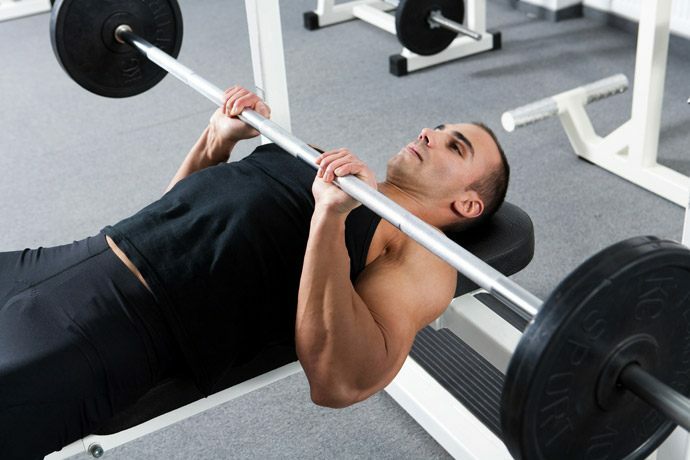 During that process, ensure that the bar only moves vertically which will almost look like hybrid bench press. Lower the weight gradually and but ensure that you stop short of allowing it to come into contact with your chest surface. After this, return the bar to its original position then repeat the process. When carrying out this exercise, repeatedly flex your wrists marginally as the bar is continually lowered. This greatly helps in keeping the weight of the bar on the lower side of the palm. During the process, pause the moment your forearms make firm contact with your biceps. Push the barbell back up until your arms become in a straight position. Repeat this process every now and again every moment you are doing the exercise. Also, when performing the JM press, you should always ensure that you maintain the bend at the elbows continuously as you keep the upper arms forward. Do this exercise while breathing out and always involve the triceps to carry the bar back up through a close grip bench press. When you are done, go back to the starting position and repeat the whole procedure. So as to minimize the involvement of the shoulder when undertaking this exercise, always maintain the elbows up thus enabling it to your elbow to fold upon itself. Also, it is important to understand that the range of motion depends on the mass of the muscle on the forearm as well as the biceps. The moment you have mastered the form and slowly succeeding in resistance, now push the barbell upwards relatively fast so as to allow for greater power development. The JM Press exercise is one of the best exercises that any serious bodybuilder, sports person or just someone who wants to keep fit should undertake. Remember developing ﻿﻿triceps ﻿muscles is never an easy affair and it is only achievable when the right type of exercise is incorporated and executed, in this case, the JM Press workout. But more importantly, JM Press exercise just like any other exercise requires consistency and perseverance. There is no way you will end up building the triceps muscles in one day; you need to do this exercise and do it correctly constantly. That point can never be emphasized enough.